More than half the orders received here are custom made to measure for everyday tightlacing / waist training needs. Here is an example of a py09 Curvy Underbust, custom ordered with a mock-up fitting. English floral coutil fabric on the outside and English coutil lined inside. Spoonbusk closure for extra lower tummy support and custom detachable wide garters added. With this particular mock-up, we were able to determine how much higher to raise the underbust line for the final corset. All corset styles can be custom made to measure. 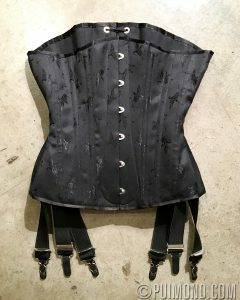 Click here fo more details and pricing to have your corset custom made. Gorgeous photo of, Jennifer, in her custom corset by Perry Gallagher.